Under Will Wade, Justin Tillman grew as the low post threat you would expect from someone with his skill level. He finished his junior year having set career highs in points and rebounds along with 11 double-doubles. What more could you want? The short answer is… three pointers. In the offseason, Wade moved on to LSU and in came Coach Mike Rhoades and Tillman’s dream of developing a ‘stretch game’ was about to come true. “The night I got here to meet with the team… You better be ready to shoot the three ball this year” said Rhoades. And that’s how it all began. So the in-the-post-double-double guy was about to morph himself into a stretch four and oh how he has embraced the role. As Coach Rhoades said “when you have the green light and your coach tells you I want you to expand your game, it’s not hard to work on your game”. And it’s apparent that Tillman worked very hard on his game. By being a threat from the top of the 3 point line, VCU cutters have room to cut to the basket which puts a lot of pressure of the defense. Keeping the defense honest allows the wing to penetrate and kick for the corner three or finish at the basket. This has been a big reason for VCU’s success on offense. It has also given fans a chance to see what type of unselfish player Tillman is. After hitting his first two three pointers, he still worked hard in the paint and stayed within the framework of the offense. 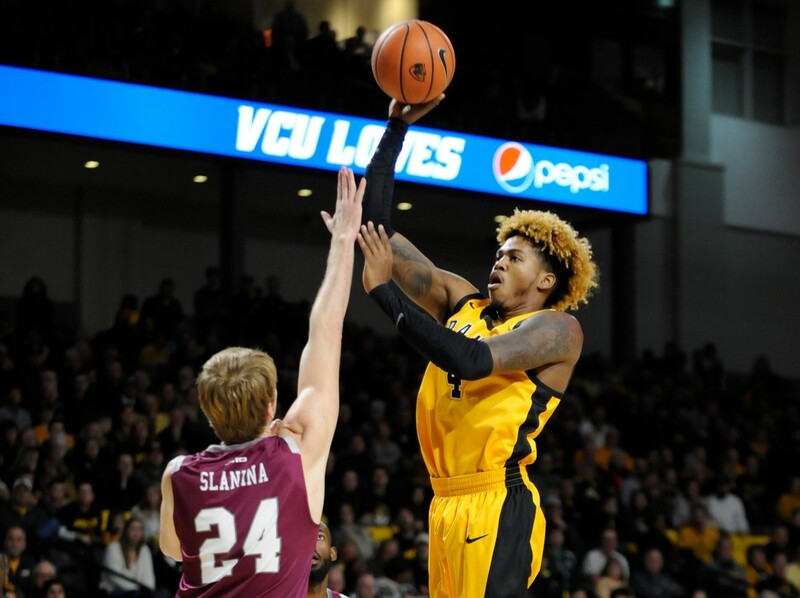 “A guy that’s 2-2 is probably hunting the next one, he wasn’t hunting the next one he was getting rebounds and finishing around the basket.” It’s made an offense already tough to defend even tougher “, said Rhoades after VCU’s victory over Fordham. Tillman is shooting 47% from the three point line. That’s a staggering percentage for anyone nevertheless a player who had only taken 3 three pointers in the first three years of his college career. Not only is it a testament to his hard work but also hit decision making. “It’s amazing when you take good shots how many of them go in”, said Coach Rhoades. Tillman hasn’t attempted more than 5 in a single game as he continues to pick and choose when to unleash the newest weapon in his arsenal. And for those who might think it has taken away from his ability to post double-doubles, it hasn’t. In the first 14 games of the season, Tillman has recorded 5 double-doubles. Too bad we only get the Rhodes-Tillman for one year. It was the perfect marriage just waiting to happen. “Meeting with Coach Rhoades him having the confidence in me saying we are going to let you develop your game”, said Tillman. That’s how good things usually start… with trust.